Finding the perfect home lighting fixtures to illuminate your place with beauty and pride can be a major obstacle for many homeowners. For some people, the task of installing a chandelier in their dining room can prove to be a double-edged sword. When done correctly, the enjoyment and value in your room can prove to make the task a smart endeavor. However, there are numerous ways in which a chandelier fixture can actually hurt your dining experiences. The Light Palace is here to help Nebraska homeowners find the residential lighting solutions they need to optimize their space. For over 60 years, our industry experts have worked diligently to help our loyal customers with honest, affordable products that have helped to keep the lights on for generations. 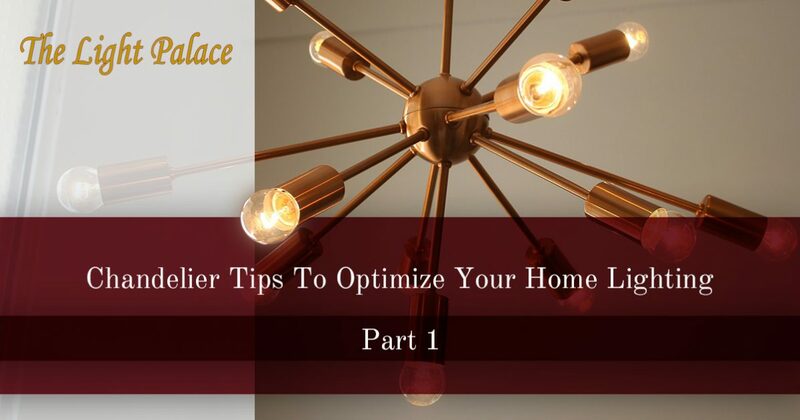 Today, we’ll discuss a few lighting tips that may help in your quest for finding and installing the best chandelier for your home. When you’re in need of quality help, be sure to stop by our expansive lighting store in Omaha! The chandelier that you ultimately choose for your home can depend heavily on your budget. Chandeliers come in all shapes, sizes, and styles to perfectly match your unique needs. Be sure to discuss your ideal and maximum budget before getting started. The last thing you want is to become excited about a chandelier only to realize it’s far out of reach financially. Our experts and comprehensive lighting showroom are here to ensure that our customers find the best products to suit every budget! Purchasing your modern lighting without a cohesive theme in mind can also be dangerous. Before browsing our quality home lighting fixtures, be sure to discuss the style and theme that you want for your dining room. Have you always fancied traditional designs? Or do you want a sleek, modern style? The choice is up to you! Chandeliers come in many different styles to provide an ideal match for nearly every home’s theme. The shape, material, and color of your chandelier should work with the surrounding environment. Anyone that fails to plan properly may own a fixture that clashes with the rest of the room, distracting guests from its flowing beauty. One of the biggest mistakes Nebraska homeowners make is not properly sizing their dining room before hitting the lighting showroom. Placing a larger chandelier in a smaller area will take up too much space and give you a tight, crowded experience. This tactic will also hurt the chandelier’s appearance, as it will seem dominating and almost oppressive. Going the smaller route can also be harmful, as tiny chandeliers in large spaces can seem insignificant or cheap. Our indoor lighting experts can be helpful in this stage. Instead of focusing on the chandelier, other options can be used if the space is simply not conducive for gorgeous chandelier lighting. Pendant lights are ideal when you need a smaller fixture to do a large job! Outside of the sizing, many residents also fail to properly hang their chandeliers to the correct height. The height, of course, comes into the decision-making process here. You do not want a chandelier that hangs low into the room, creating a distraction as well as a head-bumping hazard for guests. Too high, though, and the visual impact of your chandelier can be minimized. If you have high ceilings, you are blessed with open, airy spaces. However, higher ceilings tend to demand larger chandeliers to optimize the space. Be sure to stop by The Light Palace for assistance in this matter! As we stated earlier, the material that composes your chandelier can have a major impact on the overall presentation of the room. Purchasing that stunningly bright fixture may be exciting, yet it can clash and glare against your dark blinds and trim. It’s ideal to match the material of your chandelier to the mood and theme of the room in which it resides. Finding the right tone and mood for calming colors can go a long ways when enhanced with a perfectly matched chandelier! When it comes to outfitting your home with the best home lighting fixtures in the industry, nobody does it better than The Light Palace. Our experienced staff and comprehensive lighting showroom ensures that you’ll leave happy. Next time, we’ll continue to look at chandelier tips to optimize your dining room, as well as the solutions that our Omaha lighting store has to offer. Contact us today to learn more or stop by our showroom to get started!